MIAMI, Fl. — The Ritz-Carlton Hotel Company, L.L.C. is pleased to unveil plans for The Ritz-Carlton, Aruba, an exclusive 320-room oceanfront resort situated on the Caribbean island’s famed Palm Beach. Ushering in a new level of elegance in accommodations and amenities to the island, the grand resort will offer beautifully appointed rooms and suites, four dining outlets, a luxurious 13-treatment room spa, two swimming pools and a 24-hour casino. The hotel will also include The Ritz-Carlton Club Level, a private floor accessible only by elevator key, offering a savory selection of light fare and dedicated concierge service throughout the day. ORANJESTAD, ARUBA November 30th, 2012- by placing his signature on the Air Operating Certificate, Minister Otmar Oduber officially recognized InselAir Aruba as the newest airline of Aruba. For over 18 months InselAir Aruba worked on the creation of a new airline in Aruba which aims to promote tourism in Aruba by operating new routes. In a meeting between Minister Oduber and InselAir in 2011 it was discussed what would be the best way to promote tourism to Aruba. In this meeting it was decided that the Aruban airlines each would strive to operate to different destinations, so that maximum output is achieved from those destinations for Aruba. Up for adrenaline? Holiday Inn Resort Aruba goes Green! ARUBA December 1st, 2012- “Going Green” is more than just a saying, it is essential to the success as a hotel, and our role in corporate responsibility, as well our collective well-being as a planet and for the island. At the Holiday Inn Resort Aruba they recognize the impact of the business on the environment and are committed to conducting the business in a way that ensures environmental sustainability. All Hotels pertaining to the IHG Group are members of the Green Engage. The Green Engage programme is to reduce the Hotel’s carbon footprint by monitoring the use of water, electricity and the amount of waste materials produced. All staff are reminded daily to: Refuse, Reuse, Reduce and Recycle. Holiday Inn is Resort Aruba is dedicated in balancing their commitment to the Green Policy without compromising on the comfort, standards and enjoyment of its Guests. Holiday Inn Resort Aruba believes that environmental sustainability means good business! That’s why they are proud to be a leader in “greening” the hospitality industry in Aruba adding brand new premium bike’s as an amenity for their Guests. All Guests that stays on property with the Holiday Inn, can enjoy a complimentary thrilling bike ride or take a spin along Palm Beach on the low-impact biking trails which will leave them invigorated. New survey shows travelers ready for some “Digital Detox” on their vacations. For everyone who has ever had to deal with someone talking loudly into a cell phone while they were trying to relax, or felt pressured to be connected 24/7 to their job or elsewhere, The Marriott and Renaissance Caribbean & Mexico Resorts collection is offering a solution. The collection of nine exclusive resorts in seven locations across the Caribbean and Mexico will offer new optional “Braincation” tech-free zones beginning in December and running throughout the winter months. Guests wishing to enjoy some “digital detox” can retreat to a Braincation zone at each resort where they can enjoy peaceful relaxation with no cell phones or electronic devices in use. The Braincation zones will operate on the honor system and signs indicating an electronics-free environment will be designed to encourage guests to disconnect, relax and enjoy peaceful reading, conversation or other tech-free pursuits. IHG (InterContinental Hotels Group) announced renovation plans for upscale and resort properties in key Caribbean markets, alongside recent additions to the region’s existing hotels. Owner and franchisee community continues to demonstrate confidence in IHG’s portfolio of strong brands, growing the Holiday Inn® Brand Family, including Holiday Inn, Holiday Inn Express® and Holiday Inn Resort®, as well as Crowne Plaza® Hotels & Resorts estate. While instilled with traditional values of Caribbean hospitality the Manchebo Beach Resort & Spa delivers a rewarding contemporary guest-experience. By offering a unique blend of beach-life and gourmet cuisine, spa pampering, and high-tech amenities, the Manchebo Beach Resort & Spa creates the perfect backdrop against which guests quiet their minds and de-stress. Recently, the tropical garden terrace has been repositioned as Ike’s Bistro, serving a modern twist on Mediterranean cuisine under the guidance of the full-of-surprises Chef Ever De Peña. Manchebo Beach, Aruba (PRWEB) November 08, 2012- Just 26 years of age, the chef has nevertheless been cooking for the past 11 years. Venezuelan-born and raised in Aruba he entered the apprenticeship program at the local vocational high school at the age of 15, and for five years combined school and hands-on training, in some of Aruba’s finest restaurants under the watchful eye of the island’s top chefs. While the first dish he ever prepared as a young man was Pasta Primavera, he today deftly composes beautiful dishes with subtle and complex flavors, under-promising and over-delivering, on taste and on presentation, each time! You don't have to beg, borrow, or steal to indulge your wanderlust. Armed with these practical suggestions, your dream vacation may be more affordable than you think. Palma de Mallorca, 25th October 2012- In its constant effort to improve the service for guests and modernise its facilities, RIU Hotels & Resorts has just announced the introduction of wireless internet in its hotels on the American continent. Guests at RIU's resorts in Mexico, Punta Cana (Dominican Republic), Jamaica, the Bahamas, Aruba, Florida (United States) and Costa Rica can now enjoy a high quality internet connection in all the communal areas and rooms. What's more, in the hotels of the Riu Palace range, this service will be free from 1 November. This weekend The Old Man and The Sea will be presenting it’s newest exquisite lionfish menu paired beautifully witha glass of Pinot Grigio Mezzacorona on October 26th,27th & 28th. Music by : Carlos Bislip (please find attached for more information) Special Thanks to Natasha Richardson who during the Press Conference gave us a lecture on the impact that the fish has brought to the Island and it’s nutritional value. Why it’s important to eat lionfish? Let’s support our lionfish hunters to keep fishing more and more lionfish in order to lower the population of the lionfish. During the week Chef Christiaan & Chef Mario from The Old Man and The Sea, visited Jair Britten (lionfish hunter/Chef) to inspect the lionfish for the new exquisite menu at TOMS. PALM BEACH, ARUBA (October 15th, 2012)– Riding your bicycle in Aruba, just got a whole lot easier and fun too, check out the brand new bike lane, all around high-rise area, it’s time to give it a test drive, it’s been poven in other countries the health benefits of regular cycling significantly outweigh the risks due to traffic danger. We would like to introduce Thistle to you, one of the donkeys that is living at the Aruban Donkey Sanctuary. Thistle came to us by accident. One of the cactus fences, that keep the donkeys inside the Sanctuary, had fallen down and donkey Esmeralda had run away. The volunteers could not find her and they were worried, as she was roaming somewhere on the streets. After a few weeks there was a phone call from the neighbors: two donkeys were standing near their house. That was mystifying, as we were missing only one donkey. When we investigated, it appeared that these two donkeys were unknown to us, but they were easy to catch and they happily walked with us to the Sanctuary, Thistle in the front with a halter on, and his friend Expresso sauntering behind us. Meanwhile Thistle has been moved to Sta. Lucia, because he escaped at Bringamosa. It was the same old story: a hole in the cactus fence and a missing donkey. Finally we found Thistle in the company of another donkey in San Nicolas. Fortunately Thistle is a friendly, easy-going donkey, so the could be caught without much fuss. And so he is back in the fold, loving every minute. The false killer whale (Pseudorca crassidens) is a cetacean, and the third largest member of the oceanic dolphin family (Delphinidae). It lives in temperate and tropical waters throughout the world. As its name implies, the false killer whale shares characteristics, such as appearance, with the more widely known Orca (killer whale). Like the orca, the false killer whale attacks and kills other cetaceans. However, the two dolphin species are not closely related. Aruba a brand new pickup truck for use in their daily tasks. With this car, an Isuzu pickup, the Sanctuary has another tool to help them manage their property, including the transport of produce, to their facilities. The bad condition of the dirt road leading to the Sanctuary, makes this pickup truck an ideal vehicle for their use. The dependable mechanism and durability of the Isuzu truck has been proven time again on our island by the many Isuzu owners; which made this a simple decision to make by our management. For Garage Centraal Aruba, it has been a pleasure and privilege to cooperate with the Aruba Donkey Sanctuary, which was in dire need of a vehicle like the Isuzu pickup, so that they can continue with the preservation of the animals at the Sanctuary. The Donkey Sanctuary has thought up a nice activity for the summer holidays. Children are more than welcome every Tuesday afternoon to come and paint a nice tee-shirt or linen shopping bag. Seated among the donkeys, surrounded by a stunning piece of nature they can let their creativity loose while enjoying a soft drink and an ice cream. A team of volunteers will see to it that everything will go according to plan. Your children can have fun on Tuesday afternoons starting from 1.30 pm; for AWG. 10,-- (shopping bag) or AWG. 20,-- (tee-shirt) they get a soft drink, an ice cream and the home-made result of their flowing creative juices. The dates are 17, 24 and 31 July as well as August 7. There is room for a maximum of ten children, so register fast at desiree@arubandonkey.org or via 593-2933. You can also register via Facebook: donkeysanctuaryaruba. Just do it! The first Aruba Sinatra Dinner Show will start July 5th, 2012 and the price is $55 per person. Pictured at left: Managing Director of Divi Resorts Aruba and Bonaire Alex Nieuwmeyer with actor Xavier Samuel of The Twilight Saga: Eclipse fame at the Divi Resorts exclusive Aruba International Film Festival after-party; Managing Director of Divi Resorts Aruba and Bonaire Alex Nieuwmeyer with Academy Award and Golden Globe nominated actor Virginia Madsen, also at the Divi Resorts exclusive Aruba International Film Festival after-party. Oranjestad, Aruba – (July 23, 2012) – On Thursday night, June 28, 2012, the Divi Resorts group hosted a select assembly of film industry guests and international media for an exclusive cocktail social under the stars on an elegantly appointed outdoor terrace area at the Divi Village Golf & Beach Resort. CHICAGO (July 16, 2012) – Hyatt Corporation today announced the launch of a new, innovative menu, “For Kids By Kids,” which provides more nutritious, fresh and interactive offerings for the three million children served annually in all full-service Hyatt hotels and resorts throughout the U.S., Canada and the Caribbean. The menu is grounded in Hyatt’s industry-leading philosophy Food. Thoughtfully Sourced. Carefully Served. – promoting healthy people, a healthy planet and healthy communities – and has been developed in association with the Partnership for a Healthier America (PHA). As part of the roll out, separate from its PHA commitment, Hyatt hotels will offer a three-course organic meal for children developed exclusively for the brand by renowned food pioneer and chef, Alice Waters. PALM BEACH, ARUBA (June 19, 2012) – Recently, Hyatt Regency Aruba & Resort has announced the re-launch of Shoco Market Café, transforming the space from a coffee and ice cream shop into a full-service market with a cozy ambiance. If view is most important to you, book a Deluxe Ocean Gardenview Aruba Tower or for a higher price and additional amenities, Plaza Club Deluxe Ocean Garden View. These are the highest category of rooms before suites. Plaza Club rooms are located on the 7th and 8th floors of the Aruba Tower. All Aruba Tower rooms are premium rooms, larger guest rooms and larger baths, over those in the Bonaire and Curacao Towers. Virginia Madsen, Ray Liotta and Xavier Samuel rock the red carpet and sun at the Aruba Film Festival. Strea only takes 8 people and this snorkel tour is an excellent value for the money for an intimate tour experience. Even if you do not snorkel, I would recommend this excursion for anyone looking for a leisurely boat ride along the mangroves of Aruba’s western coastline with turquoise waters all around. Date June 14th, 2012-- “The Queen’s” restaurant featuring authentic island cuisine, has moved from Oranjestad to Palm Beach Plaza and the always popular restaurant welcomed friends and loyal patrons for a festive opening on Friday night, June 1. An elegant décor with a breezy terrace overlooking Palm Beach welcomed guests along with owner Varella Innocencia, along with pitchers of mojitos on the house for the opening night. Friends and relatives toasted this family operation with glasses of Org-e and Hynotiq liqueur. The KidSpree Vacation Club is open daily, with scheduled games and activities through the day. Shuffleboard, Volleyball, Ping-Pong, Pool-shot, Aqua-volley, face & t-shirt painting, movies, excursions, board games, play garden with jungle gym, sand castle building and lots more! The Game Room houses 13 fun machines, and a Lending Library has a variety of books to borrow for vacation reading. Private baby-sitting service is available. Optional off property excursions to interesting places are offered at a nominal fee. Travel Shop Girl Blog: International Air Travel | Preparing for Your Next...: Maybe it's your first time out of the country or perhaps it's your first trip in a few years. The last thing you're thinking about is what what to expect on your trip to the airport or on the plane. SustainableBusiness.com News 06/20/2012 04:57 PM- Sir Richard Branson and Aruba Prime Minister Mike Eman announced at Rio+20 today that Branson's Carbon War Room will work with the country to transition the island to 100% renewable energy and the world's first sustainable economy. They will create a roadmap in line with the country's consensus-driven policy making that includes Aruba's citizens. Aruba, a 33 kilometer-long island, just north of Venezuela, has one of the highest standards of living in the Caribbean with low unemployment, mostly from its strong tourism industry. June 19th, 2012- Fofoti Tours & Transfers strengthens online experience with a new website that meets their exceptional “offline” service reputation. Oranjestad, 18 June 2012 – Fofoti Tours & Transfers, the young company that has revolutionized the tours and transfers services on Aruba, has given their website, www.fofoti.com, a brand new look. Story are sometimes extremely sad, but they are stories which must be told. The Animal Relief Foundation in Aruba is always looking for assistance. Even on vacation you can help. This is an excellent analysis. Though it is very easy to hate most airlines, for any number of reasons, it is easy to see how fragile airlines are when their margins are so slim. Even more so when they are held captive to high oil prices just like the rest of us. From coast to coast, Timeshares By Owner has the vacation timeshare that’s right for you. Orlando, FL (PRWEB) May 31, 2012- It’s that time of year again, it’s vacation time! That’s right! Summer time is approaching, the kids are out of school; it’s time to plan those summer vacations and Timeshares By Owner has some of the best deals ever just for that vacation! There are amazing destinations coast to coast, from Orlando, FL to San Francisco, CA; and don’t forget their international inventory – Freeport in the Bahamas, Saint Maarten in the Virgin Islands, Aruba, and many more! We have amazing destinations coast to coast, from Orlando, FL to San Francisco, CA; and don’t forget our international inventory – Freeport in the Bahamas, Saint Maarten in the Virgin Islands, Aruba, and many more! May 26th, 2012- ORANJESTAD – Interval International, a prominent worldwide provider of vacation services, recognized Aruba-based member resorts that participated in this year’s fundraising initiative benefiting the Caribbean Hotel and Tourism Association (CHTA) Education Foundation. Earlier this month, David Callaghan, Interval’s vice president of resort sales and service, presented Foundation executives with a $60,000 donation. The shared ownership resorts in Aruba that generously contributed include the Aruba Beach Club, Caribbean Palm Village Resort, La Cabana Beach & Racquet Club, Paradise Beach Villas, Playa Linda Beach Resort, Marriott Vacation Club, and Renaissance Aruba Resort & Casino. The CHTA Education Foundation was established in 1987 as a non-profit organization through which scholarships and special assistance would be made available for the education of Caribbean hotel industry personnel and students pursuing careers in tourism. As part of its mission, it provides people throughout the region with an awareness of the industry’s varied career opportunities, as well as technical and professional development. Since its inception, the Foundation has awarded US$1.5 million in scholarships and grants to applicants who demonstrate a strong commitment to the hotel and tourism industry. As a strategic partner of CHTA and a board member of the Caribbean Tourism Organization’s Education Foundation, Interval is committed to understanding the unique needs of the Caribbean region and providing products and programs tailored to this market. Interval International operates membership programs for vacationers and provides value-added services to its developer clients worldwide. Based in Miami, Florida, the company has been a pioneer and innovator in serving the vacation ownership market since 1976. Today, Interval has an exchange network of approximately 2,700 resorts in more than 75 nations. Through offices in 15 countries, Interval offers high-quality products and benefits to resort clients and about 2 million families who are enrolled in various membership programs. Interval is an operating business of Interval Leisure Group, Inc. (Nasdaq: IILG), a leading global provider of membership and leisure services to the vacation industry. Last week a new baby boy, born late May 2012, came into the care of Aruba's Donkey Sanctuary. The sanctuary is organizing a “name the baby contest” and will draw the name out of the “hat” on June 30, 2012. Donate US$10 through their PayPal button on their website and enter your name for this cutie. Non-human names are preferred. Win this painting if your name is chosen for the little fellow. Remember all donations made to charity are tax deductible for Arubans. At 2 Fools and a Bull you will be surprised the moment you step in the door. A restored Cunucu house is the setting for a surprise dinner with an intimate number of friends. With just one seating a night, you will have great evening, mingling and meeting new people while co-owners Paul and Fred serve as your private chef and butler. At 2 Fool and a Bull you will be treated to an unforgettable culinary 5-course surprise dinner. A perfect wine-flight by the glass, is available at an extra charge for the wine lovers in the house! Or you might want to browse the Fools’ Wine Closet and find your own bottle to go with your special dining experience. The Meet & Greet starts at 7… that’s when you will be served a flute of chilled champagne, and enjoy an opportunity to mingle with other patrons, also meet the 2 Fools. The doors will close at 7.30, when the evening with your new friends begins. There are many words one could use to describe this restaurant. I am just going to say, “WOW”. For a few months two clients of Centro Man na Obra- a day care center for the mentally challenged on the island- have been working as volunteers at the Aruba Donkey Sanctuary. D’Angelo Baptiste form part of the team of volunteers on Wednesday mornings. We are all well aware that airfare prices change day to day, minute by minute. Travelocity's FareWatcher PlusSM has been doing a terrific job of notifying me of price changes for airfares which are actually AVAILABLE. NEW YORK, May 21, 2012 /PRNewswire/-- Delta Air Lines (NYSE: DAL) today announced new and expanded service to 10 popular destinations in the Caribbean, Bermuda and Florida from LaGuardia Airport and John F. Kennedy International Airport, continuing its historic expansion in New York. This Fofoti tree pictured, can be viewed on the right (north side) of the road heading west out of Arikok National Park. CALGARY, May 6, 2012 /CNW/ - WestJet announced the launch of new, non-stop seasonal service between Toronto and Aruba, Netherlands Antilles. The inaugural flight departed Toronto's Pearson International Airport at 9 a.m. EDT Sunday. This month the Aruban Donkey Sanctuary celebrates its fifteenth anniversary. In 1997 a few volunteers started catching and sheltering roaming donkeys. At first there were just 10 donkeys; by now there are 120 animals, who find a home at the sanctuary. Roaming donkeys are a hazard for the busy roads with heavy traffic and vice versa. The donkeys belong to the Aruban landscape, however, and they have become a tourist attraction: more than 25,000 visitors cross the gates of the sanctuary every year. There are still some 70 roaming donkeys left - still causing accidents. MIAMI, FL--(Marketwire - May 1, 2012)- Harley-Davidson honors women riders across the globe this May by inviting them to join Women Riders Month events. During the month of May, hundreds of women riders from Latin America to the Caribbean will join thousands of other women in countries around the world to showcase their passion for the sport of motorcycling during the 6th Annual International Female Ride Day. What began in 2007 with a simple concept of "connecting women with motorcycling" has grown into a worldwide event, founded by MOTORESS in Toronto, Canada, inviting women riders around the world to "just ride," an idea that is passionately supported by industry leader Harley-Davidson. In celebration of this initiative, Aruba will be hosting their 3rd Annual Ladies of Harley Ride from May 4th to May 6th, consisting of a Garage Party at the dealership on May 4th, 2012 from 7 pm to 9 pm, night ride on May 5th to Moomba Beach with live music by Dushi Band and daytime ride May 6th with DJ entertainment, food, drinks and prizes to announce the new Ladies of Harley Queen of 2012. Last year's event was very successful, inspiring many women to join the motorcycle world. This year, it promises to be even more successful as Karen Davidson, creative director for Harley-Davidson General Merchandise and Great-Granddaughter of Co-Founder William Davidson, will be in attendance. ORANJESTAD, ARUBA--(Marketwire - Apr 24, 2012)- Aruba -- even the word alone conjures up images of beautiful beaches, friendly people, and relaxing with a tropical drink in hand. And it's all for good reason -- this breathtaking paradise offers everything a visitor could desire for a tropical getaway. And when visitors want to add a layer of luxury and seclusion to their Aruba spa resorts, they do it at the private island at the Renaissance Aruba Resort & Casino. This is an amazing website full of Aruba history including photographs. If you scroll about half way down you will see a few photos of Palm beach in the 1950's, including an artist rendering of the newly completed Aruba Caribbean Hotel, the first luxury hotel on the island. The page also mentions the Ritz Carlton but evidently has not been updated since construction has progressed. Airlines are required to compensate passengers for reasonable expenses for loss, damage or delay in the carriage of passenger baggage. Airlines are required to disclose baggage fees when passengers book a flight. Airlines are required to apply baggage allowances and fees the same throughout a passenger’s journey. canceling or changing reservations, or advanced or upgraded seating. Link: New Online Travel Shopping Trends: 4,638 travelers in the U.S., U.K., Germany, India, Russia and Brazil are surveyed to identify trend-setting consumers' behavior and motivations when shopping for travel online and identifies their experience during the destination selection, shopping and booking processes. The diminutive southern Caribbean island of Aruba, lying less than 20 miles from mainland South America, attracts over half a million tourists from far and wide, each year. Some come for the luxury accommodation, gorgeous beaches and guaranteed good weather, but huge numbers are drawn to this little piece of paradise by the excellent snorkeling, and more significantly, the fabulous diving opportunities, it presents. There are over 40 Aruba diving sites, the majority situated off the sheltered south western coast and the many local dive operators have developed a smooth and professional operation to allow visitors a truly memorable experience. Is Aruba's Drink Water Safe? Aruba tap (drinking) water comes from their desalination plant. As of 2007, it was the third largest in the world. "World Health Organization’s health criteria for TDS (total dissolved solids) is 600 parts per million (ppm). Aruba’s drinking water contains 5 to 15 ppm of Total Dissolved Solids, 40 times better than the criteria for TDS in water supplies. " You will want ice cubes. Water comes out of the tap warm. Many of the water pipes run above ground due to much of the island being rock. Packing tip: If you have a mini-fridge in your hotel room, pack a plastic one quart pitcher from home. Being plastic it is light weight and to conserve space you can stuff it with CLEAN socks and tuck right into your suitcase for the trip to Aruba. 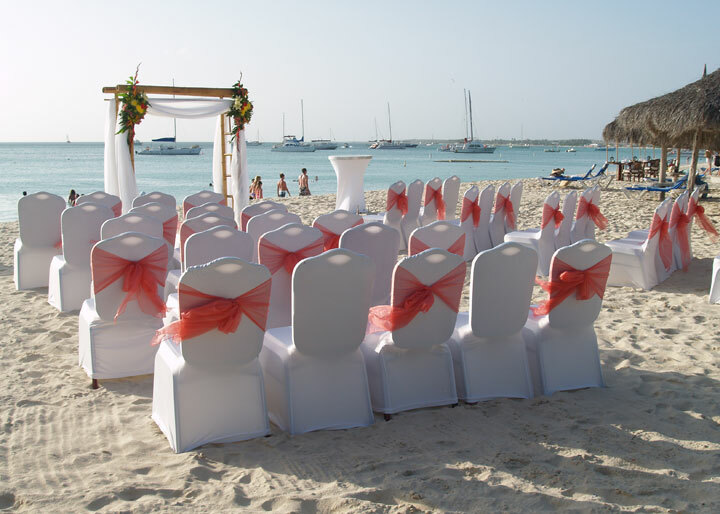 A perennial favorite for honeymooners and others seeking romantic travel, Aruba is known for its year round high temperatures and its gorgeous white sandy beaches. This is the perfect destination for couples who love relaxing at the beach, shopping, gambling, a great nightlife, and water sports. Palm Beach, ARUBA (PRWEB) April 03, 2012- Aruba Marriott Resort announces the installation of Flyte Systems, a premium travel information service being offered to guests of the resort. Flyte Systems is the leading provider of airport travel information for the hospitality industry, digital signage, convention centers and related businesses. Now, when staying at the Aruba Marriott Resort, guests can check-in to their flight and print their boarding pass at the resort with its new FlytePass system. FlytePass gives guests greater travel peace of mind by enabling them to confirm flights and securely print boarding pass documents at the property’s front desk area.